One of the essential characteristics of creative and highly innovative cultures is their ability to recognize and leverage conflict. Granted, for any organization or team, one of the greatest challenges it faces is how to effectively manage competing interests, differing views, disagreement, and multiple mindsets, all of which are natural sources of conflict. However, when managed through the framework of design thinking, they’re also great contributors to innovation. The struggle for most organizations and their leaders is in finding the right approach to confronting and realizing the potential for innovation that resides in the natural creativity that lives in the multitude of conflicts that they deal with. Conflicts are all too often avoided, thereby leaving the sources of innovation and creativity untapped. One of the most powerful solutions to finding the right “how” for many of the most innovative organizations is their use of design thinking. Design thinking is a way of leading with creativity and it encourages embracing ambiguity and uncertainty. It offers a platform for managing diverse thinking and strategies and, in doing so, it offers the opportunity to curiously confront conflicts in a constructive way. In spending resources to teach design thinking to their members and develop it as a core competency, organizations leverage the benefit they get from using it as a management tool for converting disagreement into the fuel necessary for innovation. In our research that led to the writing of our new book Innovation By Design, Thomas Lockwood and I identified ten attributes that the 21 highly innovative, design thinking organizations in our study group all possess. The one that we found to consistently lead to constructively managing conflict is Curious Confrontation. 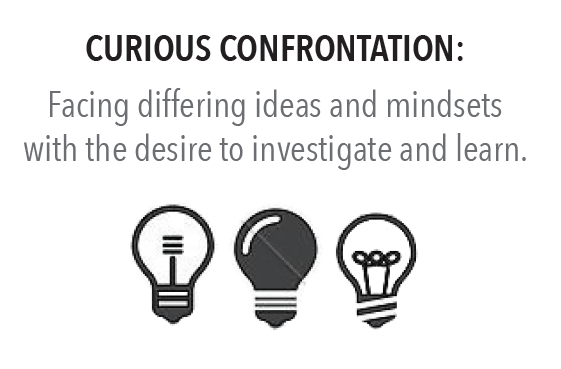 We define Curious Confrontation as: The ability to face differing ideas and mindsets with the desire to investigate and learn. When confronting conflict, it is the ability to act with curiosity that results in the intentional inquiry and appreciation of differing points of view and mindsets that inevitably results in healthy collaboration. Along with research that finds a sense of curiosity as a characteristic of genius, one’s curiosity quotient (CQ) is also a critical contributor to one’s level of social intelligence. Research shows that curious people have more friends, more significant relationships, and are viewed by others more highly than those with less curiosity. In light of their increased ability to be more inquiring, others see them as more considerate, interested, and empathetic. As a result, they are seen as more likable. Research also indicates that people who are curious are happier, healthier, more productive, and have better social relationships. The reality is that every organization has its struggles in dealing with the differing points of view, values, and beliefs we all have. As a result, we don’t generally listen to one another very well. While confronting conflict has more than its fair share of negative connotation attached to it, acting intentionally with curiosity sets the stage for the openness and trust necessary for free expression and higher levels of creativity and innovation. This, in turn, builds empathy. Empathy is paramount for users of design thinking. Through our research, we found that not only does design thinking provide a framework for people to express themselves, it also provides a platform for listening and empathy. Empathy, as displayed through genuine inquiry and expression, is paramount for users of design thinking. As the result of lessened levels of fear, empathy leads to the increased levels of emotional maturity and safety that directly impact how diverse views and ideas are constructively managed. This results in a significant influence on an organization or team’s culture. A cornerstone to how people interpret culture, and often the first impression that people get about what is acceptable and unacceptable behavior, is based on their experience of how disagreement and conflict are managed. More than at any other moment in time, people learn about the culture they’re in when they experience conflict and discover what feels safe, as well as what feels unsafe. By asking how design thinking helps people manage disagreement and conflict in our research, we came to recognize the importance that curiosity plays in the intentional management of conflict as the source of innovation that it is. Curious Confrontation is the key attribute that consistently plays a role across our study group organizations to foster empathy and create healthy relationships that support teamwork and lead to innovation. Organizations using design thinking have a belief in, and positive mindset about, curiosity. People who use design thinking demonstrate better inquiry, empathy, and listening skills, which is key in managing disagreement and conflict effectively, and building trust. Because design thinking skills can be applied to dealing with disagreement and conflict, confrontation happens in a more timely and healthier manner, thereby avoiding much of the dysfunction and consequences associated with avoidance. Design thinking is a valued process for confronting disagreements and misalignment’s among functions, and their leaders, and effectively breaking down unhealthy silos. This creates synergy, design thinking organizations leverage creativity.